Description: Q595 slows for a meet with Q556 at Courtland. Description: Tied down due to the flooding behind a Q131 at Greencastle and a Q367 baretable train at QS34.54. Description: CSX Q324-06 is looking to Toledo, as it slowly heads for the NW connection in Deshler interlocking. Description: 7 engines and 135 cars! 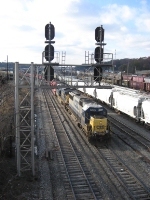 Description: CSX SD50-2 8500 trails on Q57328 South. Description: This older SD50 churns away with a very clean and or freshly pained SD40-2. This is the Hamlet to Raleigh and back local, F742 leaving Hamlet. Description: 8500 stops to set off a train of loaded coke cars at Whiting, IN. Description: Decided to try the "Ethan Effect" on a train. Two CSX (ex SBD) SD50s prepare to drop a load of coke in Whiting, IN. Description: CSX SD50-2 8500 leads Q231 (Detroit Mi. to Louisville Ky. autoracks) along Kentucky Highway 467, south of Sanders. CSX 7302 is trailing. Description: CSX SD50-2 8500 leads Q231 (Detroit Mi. to Louisville Ky. autoracks) into Turner's Station, taken from the Mill Creek Road crossing. CSX 7302 is trailing. Description: CSX SD50-2 8500 leads Q231 (Detroit Mi. to Louisville Ky. autoracks) up the main at Campbellsburg, to meet S226. CSX 7302 is trailing.